This is the question I have asked, since the day I could talk. Why. I take absolutely nothing for face value, everything must be questioned and analyzed. This probably my most distinctive, aggravating, but also fortunate trait. I ask why. I just do. From age 3 to the present I have not stopped. So...when choosing items for the house, I am no different. I will ask for something, and at times I am told, "no, you can't do that". And of course, I respond with, why? In this case, I wanted marble countertops. 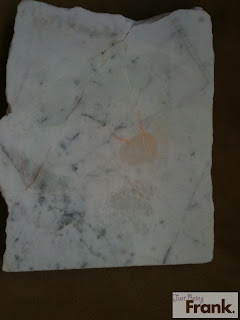 We couldn't find the right color in granite, limestone does not come in large enough pieces, so I wanted marble. The designer initially said no. I said why. She is clearly not yet sick of my constant questions, and came up with a suggesstion. Why don't I get you a sample of the marble, you try and destroy it, and see what happens, and then you can answer your own question. Above find the evidence of my destruction test. Bottle opener, lemon juice, chocolate frosting, sriracha sauce and blueberries. Yea, well as it turns out, I learned why we cannot have marble. 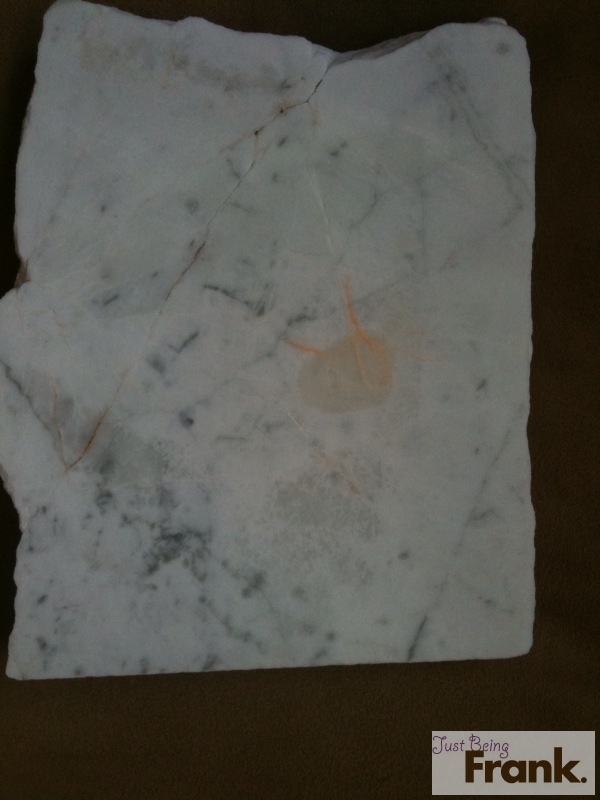 As you can see, the sealed marble still took on some serious stains. The sriracha was the most significant stain that you can see towards the middle on the right hand side. The can opener made enormous scratches, and the lemon juice completely removed the sealant on the marble. Okay, okay, so I have an answer to my why! No more marble. It has been decided, we will use the Ceasar Stone. 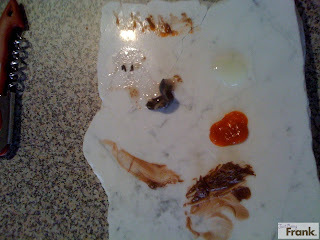 And now you know why you cannot have marble counter tops. Or if you do, why you must be very careful with them. And I am just not careful. Marble you are beautiful, but alas, I will leave you for purposes other than counters. Awesome testing! I love when people do some home science and come up with tangible results! Sorry to hear they weren't the results you wanted. Some friends of ours have a marble kitchen island. She said that it will etch if citrus juice and fresh tomatoes are left on it overnight. And they also can't put hot pans on it. :( bummer - It looks beautiful! Good luck with the CaesarStone! !